AMMONNEWS - The cast and producers of CW’s new “Charmed” are defending the reboot as a story for its time. The drama series about three young half-sisters who are witches will confront modern issues including the MeToo movement, executive producer Jennie Snyder Urman told a TV critics’ meeting Monday. The varied ethnicity of the sisterly trio - white, Latina and African-American - also gives the reboot more currency, Urman said. The women have the same mother but different fathers. Most people she’s talked to are in favor of the switch to characters of color, said Urman. She also produces CW’s Latino family comedy “Jane The Virgin,” which will end after its upcoming fifth season. “We’ve had the chance to see three white witches. And obviously coming off ‘Jane,’ I know so much more about what it means to be on screen, to see yourself represented, to see yourself being the hero of the story,” Urman said. The varied backgrounds of the witches played by Sarah Jeffrey, Melonie Diaz and Madeleine Mantock also allows the show to explore witchcraft as it exists in different cultures, she said. Urman acknowledged there’s been fan unhappiness with the fact “Charmed” is a reboot and not a revival of the original series. The drama debuted in 1998 with Holly Marie Combs, Alyssa Milano and Shannen Doherty as the three Halliwell witch-sisters. Rose McGowan joined the series in 2006. “Charmed belongs to the 4 of us, our vast amount of writers, crews and predominantly the fans,” she wrote on Twitter last January. “FYI you will not fool them by owning” a title. 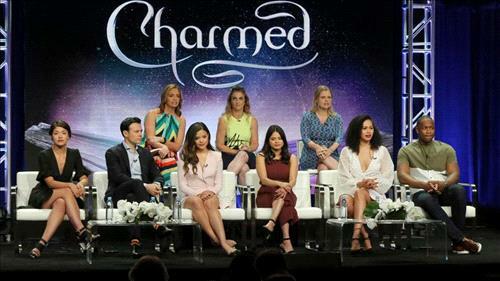 Those involved with the reboot understand that “Charmed” is a “sacred thing” to the original cast and its fans, Jeffrey said. “Of course, we can’t help but be a little disappointed because I think the script is fantastic,” Mantock said. At its core, the show is a love story of the three sisters, Urman said, making it true to the original despite changes.